Today I announce my decision to resign as Seattle City Councilmember for District 4. It has been a distinct honor and privilege to work in this capacity, representing the many different people and the great diversity of opinions that give Northeast Seattle its vibrancy. Earlier this week I was proud to cast my vote in favor of Mandatory Housing Affordability (MHA). This legislation, which passed unanimously, helps address our city’s affordability crisis by providing 6,000 new income- and rent-restricted homes over the next ten years, and I am honored to have led the passage of long-overdue step to live up to our goals as an equitable and livable city for all. I am proud that over my tenure as a city councilmember, Seattle voters have approved a series of levies that will indelibly shape our communities for generations to come. First, Sound Transit 3 guaranteed our ability to continue building out a fast, reliable, and affordable mass transit system throughout the region. Second, through a nearly doubled Housing Levy, we made a huge investment in the production and preservation of affordable apartments and rental support for families at risk of experiencing homelessness. And third, by renewing the Families, Preschool & Promise Levy, we recommitted our focus on closing the opportunity gap and making sure that all students in our public schools, from pre-k through high school and beyond are given the tools and support to thrive. I am proud to have helped pass three city budgets that invested in fostering community, making the city more affordable, achieving greater public safety through funding the hiring of more police officers, and supporting kids and families – values shared among my constituents and colleagues. I am proud to have joined my colleagues in support of the establishment of a safe consumption site in Seattle which will help remove the painful stigma of people struggling with addiction and will save lives. I am proud to have eliminated parking requirements in areas of frequent transit to help us meet our climate change and affordability goals. And I am proud to have been a voice and advocate for neighborhood priorities including critical safety improvements along the 65th corridor, the installation of sidewalks on NE 50th, a much-needed renovation of the Magnuson Park Community Center, and ensuring that all of our wading pools across the city were open during summer months. While I am very excited for the next chapter of my career with NHL Seattle, I have been so inspired by those I’ve gotten to know and work with over the years; to the neighborhood leaders, small business owners, housing advocates and City of Seattle department leaders and their staff members – thank you for your engagement, for sharing your talents and thoughts, and for all you do for your communities. My final day at City Hall will be April 5, 2019 and I am confident my council colleagues will conduct a fair and inclusive process to find and appoint a district representative to serve through the end of the year. Posted: March 21st, 2019 under Councilmember Johnson. Posted: November 21st, 2018 under Councilmember Johnson. In the wake of an exciting election night on Tuesday, many will now turn their attention to our district elections next year. With the goal of respectful transparency and a desire to hold the door open for those who might be interested in running for the District 4 seat, I am announcing that I will not be seeking reelection next year. I chose to run for City Council because I feel deeply committed to Seattle and wanted to help our city navigate a period of tremendous change by ensuring we keep the challenges of climate change, inequality and affordability at the forefront. I knew that preparing our city for the future would require difficult choices of all of us, which it has, but I am tremendously proud of what we have accomplished in the past three years. And most recently, the Families and Education, Preschool and Promise levy will support our next generation, giving them the tools and support they will need to thrive. 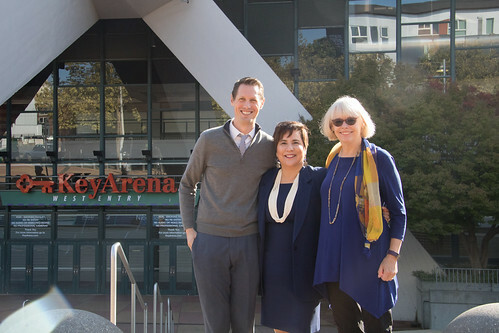 And supporting the vibrancy of the City by supporting arts, culture and sports, like the redevelopment of Key Arena – the types of events and programs which remind us of the joy and power of coming together. And expanding Law Enforcement Assisted Diversion (LEAD) into the north end. While this job has been more humbling and rewarding than I ever could have anticipated back when I took office in 2016, I have come to acknowledge the strain this role places on family life. As any parent could relate, time seems to move faster each year, and I look forward to spending more time with my family, being an active PTSA member at my girls’ school, and remaining civically engaged in this city we call home. I’m truly grateful to have worked with such an amazing team. Our office has been proud to volunteer for quarterly service projects, to be focused on professional service, and to advance a common agenda. They have been a real joy to work with and deserve much of the credit for the successes we’ve had. I look forward to continuing close collaborations with D4 residents, community partners, and my dedicated and passionate Council colleagues in 2019 to work towards a more affordable, livable, and transit-connected city. Posted: November 8th, 2018 under Councilmember Johnson. No matter your view on the proposed employee hours tax, there’s a strong consensus that there is a homelessness crisis that needs to be solved. This crisis facing our city and our region is human and visible and growing. By the last count 8,522 people were experiencing homelessness in Seattle. While I continue to hear frustration that the City is just ‘throwing money at the problem,’ I believe that we are making strategic, results-oriented investments. In 2016, King County saw 6,128 exits to permanent housing, and through Seattle’s Office of Housing, we invested $93.4 million into 1,478 new and preserved affordable housing units in 2017. These investments are succeeding in getting people off the streets, yet the increasing rate of homelessness is outpacing our efforts. As our city experiences historic growth we must reckon with the economic disparity it creates; studies show that a 5 percent rent increase in Seattle pushes over 250 people into homelessness. And during a time when rents and the cost of housing are skyrocketing, so too are our numbers of neighbors falling into homelessness. Any solution to help address our homelessness crisis, in my opinion, must produce immediate results and protect the long term economic health of the city. I believe we – not just this council but the mayor and other agencies in jurisdictions up and down the west coast – have a moral obligation to offer our unsheltered neighbors safer and healthier living arrangements than our sidewalks, parks, and freeway ramps. I believe that the bill should include a request for affirmative renewal. The state of emergency in which we are currently operating requires us to look at all the resources available to address our homelessness crisis. But I have confidence that we will reach a time when we are no longer in that state of emergency. Thus, treating this proposed revenue more like a levy, with an affirmative renewal requirement built in, affords us a degree of flexibility that is important to me. A second priority of mine is the desire to build more affordable housing, not dedicating our limited resources towards debt service. Utilizing a pay as you go model maximizes our investments and ultimately allows us to deliver more units. This model has been a hallmark of our process as a city in building affordable housing and one I strongly support. Another clear goal I have is that we land on a revenue source that falls between $25-75 million. That was the initial goal outlined in Resolution 31782 and one I feel we should remain within. I believe a proposed $250 tax finds a good middle ground with a total impact of $40 million per year. Lastly, as one of the whereas clauses in this ordinance states, “this collaborative effort requires the active engagement of interested and affected stakeholders, including non-profit organizations, affordable housing providers, faith and civic leaders, businesses, labor, and community members.” I believe it is important that we adhere to an approach that can and will get the support of these different stakeholder groups. No matter the final number we land on through an employee hours tax, we know we need our city funds to be leveraged by a massive regional investment in affordable housing, requiring the support and engagement from these parties. With the final vote currently anticipated to take place on Monday, May 14, I wanted to share what will be impacting my decision. I want to thank my council colleagues for their hard work on this topic and all who have been engaging with us and sharing their thoughts. We all want to succeed in bringing our neighbors inside. Posted: May 11th, 2018 under Councilmember Johnson. I have been hearing from many who live and work near 35th Avenue expressing both support for and concerns about the upcoming paving project. Ultimately, I still believe that the proposed changes will result in a safer corridor for everyone traveling through the neighborhood and will help allow more people to choose to walk or bike, which we need to meet climate change objectives and ease traffic congestion. While there are many aspects subject to disagreement within the scope of this project, I think we can all agree that safety improvements are necessary along 35th. For the last few years we’ve seen an average speed of more than 30 miles an hour and we know that speeding kills: a pedestrian hit by a car at 40mph only has a 10% chance of survival while a pedestrian hit by a car at 20mph has a 90% chance of survival. There have been over 250 collisions on this street in the last five years and the new bus service on 35th NE is increasing the number of pedestrians trying to cross the street. Given these factors, it is imperative for me that we make this street safer for all – pedestrians, cyclists, and drivers alike. How we go about making 35th safer is where I hear many, many differences of opinion. What I hear most from folks is around the proposed bike lanes, changes to parking and the resulting impact on businesses along the corridor – and I want to address all three. Some question why the greenway on the 39th is not sufficient. While greenways are an important part of the bike network, they do not have the same benefits as dedicated, protected lanes, either in terms of safety or ridership. Furthermore, it does not protect cyclists on 35th where the majority of destinations are located. Additionally, because of the city’s commute trip reduction goals through the Major Institution Master Plan, two of Seattle’s major employers, Children’s Hospital and University of Washington, are doing excellent work in encouraging their commuters to shift the mode of transportation they take to and from work away from driving. Because we are asking them to meet certain goals, we have an obligation to increase our protections for those who make the shift out of their vehicles and onto their bikes. Much analysis has been done to look at the impacts to parking along this stretch and the data shows that there is sufficient parking available. For example, on weekdays between 10:00 am and 2:00 pm, on every block parking utilization was less than 70%, and most blocks were under 55%. Numbers were very similar for weekends during that same timeframe, and also during weekdays during morning and evening rush hours. To put that in a different context, in one snapshot of time during a weekend between 10:00 am – 2:00 pm, 591 out of 653 total parking spaces were available. This project involves removing parking on the west side of 35th, south of 85th. Parking will be available on the east side of the street all day, and there won’t be peak-hour parking restrictions as there are today. The scope of this project also reconfigures some East/West streets to better handle parking demand. For example, we will be installing more 2 hour limited parking signs to increase parking turnover and availability for business patrons. Many have voiced concerns around the health of our retail and service centers, like the library, that operate along 35th. Supporting business and bicycle/pedestrian infrastructure is not an “either/or” for me – studies show that having bike lanes increase traffic in and out of businesses. A recent study from the State Smart Transportation Initiative shows that street improvements such as bicycle lanes that replace parking spaces and lanes of traffic do not impede – and even boost – economic growth. Additionally, SDOT has been working closely with businesses and service centers to be responsive and accommodate unique requests. I’ve heard from several community members that they’d like to see some additional safety traffic improvements on corresponding North/South streets. I’ve particularly heard from folks about additional investments like a speed island at 77th and 34th, speed bumps on 80th between 35th and 30th and on 30th between 80th and 75th, and a light (or more clearly marked pedestrian crossing) at 77th and/or 80th. Some of these suggested improvements didn’t make it in to the final design, because they either fall outside the scope of the project, or need to be determined after implementation. I’m working with the project team to identify additional resources that may be available to make those additional investments to correspond with the corridor improvements. I also look forward to working with you and SDOT to regularly monitor the success of our investment. If we are not meeting benchmarks and desired outcomes and if markedly slower traffic becomes the unintended impact that many believe it will, we have the opportunity to change course and make design improvements. To achieve a greener, healthier city for all of us to live in, I unabashedly support Seattle’s goals to make it safe for people who choose to ride their bicycles or walk. I understand that many Seattleites need to drive their cars for a whole host of different reasons (health reasons, juggling family schedules etc. ), I believe that we can and should balance the needs of all users to ensure our streets are accessible, efficient, and above all, safe for everyone. Pucher, John, and Ralph Buehler. “Safer Cycling Through Improved Infrastructure.” American Journal of Public Health, Dec. 2016. State Smart Transportation Initiative. (Producer). Bike and Pedestrian Street Improvements and Economic Activity in NYC [Video webinar]. Posted: March 1st, 2018 under Councilmember Johnson. As the chair of the Planning, Land Use & Zoning Committee and as the representative for District 4, I have heard a lot this year about ways that we can support livability as our city grows. Funding infrastructure improvements for mobility, parks, and public safety are critical to meet the needs of current and future residents. The following budget adds that I sponsored or co sponsored reflect the key values on which we, as a city, must remain focused. And I sponsored a study to look at strategies to implement public-sector child care. And I was happy to support the $600,00 addition to support the planning, public outreach and design of a walkable, bikeable path uniting the Georgetown and South Park neighborhoods. And I was happy to support the addition of $450,000 to open and support two additional authorized encampments. And I was very supportive of the add of $75,000 to support the Home and Hope Project’s creation of quality affordable housing and early learning opportunities. Finally, I want to thank my colleagues who brought forward the HOMES tax proposal. Even without its passage, it focused our budget urgently and rightly on the needs of those unsheltered. It focused our collective values and found consensus on the outcomes we need to see to make a difference. While there is yet much more to be done, I am proud that our budget invests in homeless youth, support for survivors of gender-based violence, Pathways Home recommendations, and more shelter options. Posted: November 20th, 2017 under Councilmember Johnson. This Monday kicked off my second City budget cycle as Mayor Burgess presented his proposal to the Council (you can watch the budget speech here). Councilmembers and staff are in the initial stages of reviewing the investments detailed in the proposal, but I wanted to call out a few early budget wins and projects included in the Mayor’s proposal that align directly with my priorities, and those of my constituents. With the historic levels of growth our city is experiencing, funding affordable housing and supporting projects that reflect our cultural heritage are absolutely necessary investments. This year I proposed a new tax on short term rentals that gives long term and permanent funding to build more affordable housing projects and funds projects that preserve our city’s cultural heritage. I’m a big believer in green stormwater infrastructure (GSI), so recently I sponsored an amendment to double the amount we spent on GSI without raising consumer rate paths. What is GSI? Click here to learn more, but overall, these investments help to address flooding and climate change impacts, create long term job opportunities (both in the creation and maintenance of the new GSI projects), incentivize more private sector development, and increase walkability and greenspace. I am thrilled to see funding allocated for the renovation of the Magnuson Park Community Center. This renovation, beginning in 2018, will provide much needed space for additional programming for the kids and adults who live, work, and play in the park. I’ve heard from many constituents about the unsettling rise in property crime throughout our neighborhoods, so I am pleased to see the funds needed to fulfill our commitment to expand the police force by 200 officers. Resulting in a 15% increase in SPD’s uniformed personnel, this funding builds off of my 2017 budget goal to increase the number of officers and reduce response times. With the success our Navigation Team has demonstrated getting those living outside to accept offers of shelter, I am happy to see additional funds for a second team outlined among other critical investments to address the homelessness crisis. Because I strongly believe that including arts in education is an integral component of setting our students up for success, I am very glad to see the funds allocated to ensure Creative Advantage (a collaboration between our Office of Arts and Culture, Seattle Public Schools, and community partners) is operating in all Seattle’s public schools by 2022. There are additional priorities I’ll be pushing for over the course of the budget process, including the renovation of the Burke Gilman Trail from UW to the U Village and ensuring the expansion of our successful Law Enforcement Assisted Diversion (LEAD) to the north end. I’ll also be looking for ways that we can increase support for our local businesses to grow and how we can make our neighborhood streets safer for kids. Look out for more updates as the budget process gets underway. I hope you are able to join us and share your thoughts! If you are unable to attend, you can always reach out to our office with your comments at 206.684.8808 or Rob.Johnson@seattle.gov. Posted: September 26th, 2017 under Councilmember Johnson. I’ve had some very meaningful conversations over the last month with residents and neighborhood leaders in and around Magnuson Park, city officials, and Solid Ground Administrators about changes they want to see in their community – changes that are even more important following the tragic death of Charleena Lyles. Through these conversations, we’ve outlined a set of strategies to realize a safer community offering more positive and healthy opportunities. That list is a long one, including community center space renovation, better lighting in the park, increased transit access, and significantly better healthy food access. Many of these needs I will address through our budget process in the fall. However, the second quarter supplemental budget (currently being discussed in the Affordable Housing, Neighborhoods & Finance Committee) represents an opportunity to re-prioritize existing funds and use them to help support some short-term needs of those living in the park. One priority I heard loud and clear from everyone with whom I spoke was the need for more engaging programming for youth and adults at Magnuson Park Community Center. We need to fund a staff member dedicated to creating positive mental and physical health programming and to connecting users with the many nonprofit programs that already exist in the park. I plan to bring an amendment forward at the August 2nd AHNF committee meeting to use city funds to support programming and staffing at the community center. And I have called on different departments and agencies to address needs as well: the Department of Parks and Recreation is exploring modifications to enhance lighting in Magnuson, our Human Services Department is looking into helping Solid Ground provide more on-site support at Brettler Family Place, and Metro is making changes to provide bus service to the park on evenings and weekends. It is deeply important to me to work with my colleagues to see these critical near term changes implemented by the start of the school year to support the residents and our community. Posted: July 20th, 2017 under Councilmember Johnson.